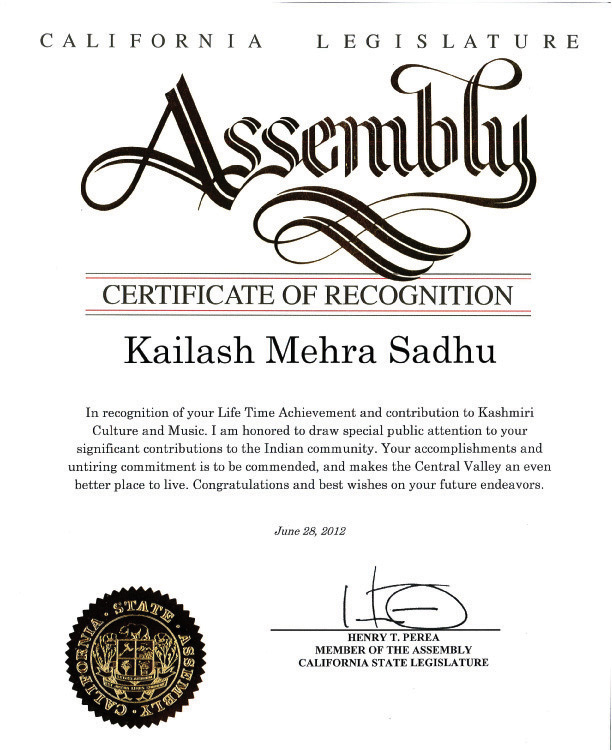 t is historic and significant that the California State Senate has not only recognized Kailash Mehra Sadhu for her lifetime achievements and contributions to advancing Kashmiri Culture and Music, but also passed a resolution in the State Senate recognizing the fact that 500,000 Kashmiri Pandits were internally displaced and dislodged by acts of terrorism, many of whom immigrated to the united States and that majority of the Kashmiri Pandits have not, due to fear, returned to their places of birth, not even as tourists. Honorable Michael J Rubio from the 16th Senatorial District presented the resolution in the state Senate on June 28th, 2012. This was the first day the 5th Annual camp of Kashmiri Pandits at Oakhurst/Basss Lake in California, USA. Kashmiri Pandits from all over came together to celebrate the July fourth weekend and connect with their compatriots. The weekend was a celebration of freedom, with roots that lay in 6000 year old history in the lap of Western Himalayas in the Kashmir Valley. Efforts made by members of Kashmir Hindu Foundation, Inc a Non-profit/tax exempt organization registered in USA in creating a platform for such meets for Kashmiri Hindus has been appreciated by all who attended such memorable meet. 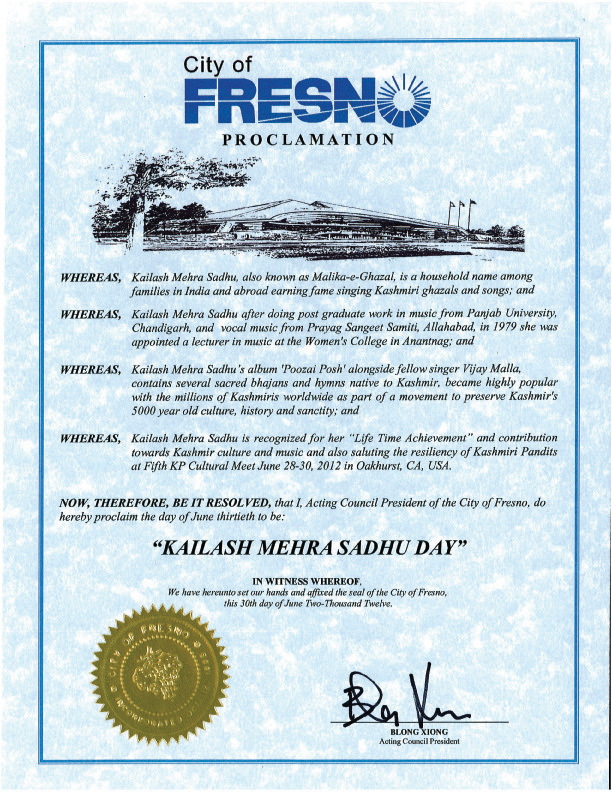 City of Fresno in recognition of her life time achievement and contribution towards Kashmiri culture and music. The award was given to her on June 28 in Oakhurst, CA, USA. 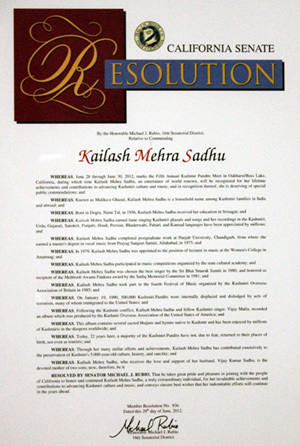 It also proclaimed to celebrate the June 30th as Kailash Mehra Sadhu Day. John Garamendi, member of US Congress, House of representative, Washington DC also recognized her for Lifetime achievement and contribution to Kashmiri culture and music. 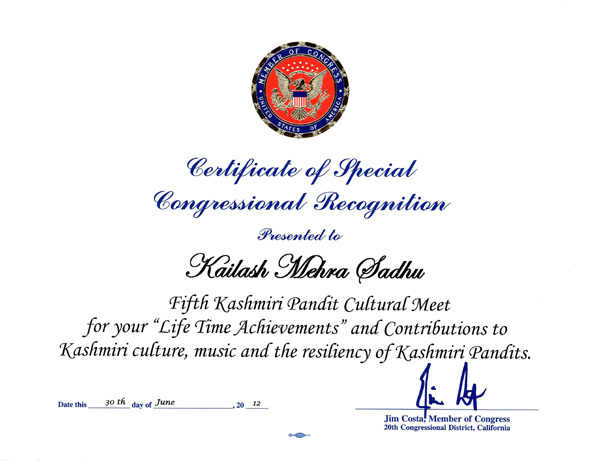 She was also conferred another award and certificate of special Congressional recognition by Jim Costa, member of Congress on June 30th at 5th Kashmiri Pandit Cultural meet. Certificate of Appreciation was presented by Harvey L Hall - Mayor of City of Bakersfield. Attached below are some of the certicates presented as well as some excerpts from the California State Senate Resolution. RESOLVED BY SENATOR MICHAEL J. RUBIO. That he takes pride and pleasure in joining with the people of California to honor and commend Kailash Mehra Sadhu a truly extraordinary individual, for her invaluable achievements and contributions to advancing Kashmiri Culture and music, and conveys sincere best wishes that her indomitable efforts will continue in the years ahead. It is a proud moment for the community. Congratulations!